Why choose something else, when you can get your very own .PW domain name. If you are a professional looking to go online, .PW is the perfect name for you. Whether you’re a Doctor, Lawyer, Blogger, Consultant, Musician, Artist or Internet professional, looking to establish a professional online presence - .PW is for you! The registrations process is the simplest in the industry and there are absolutely NO RESTRICTIONS, or documents required to register a .PW name. Anyone from anywhere across the globe can register a .PW domain name. 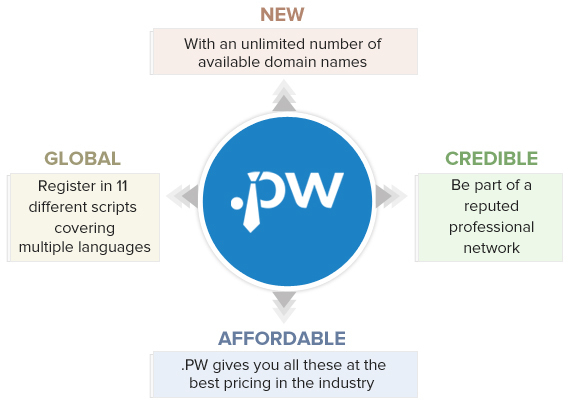 GO LOCAL with a .PW domain name in the language of your choice – IDNs supported in Chinese, Japanese, Arabic, Hebrew, Spanish, Russian, Turkish and many more. The .PW Registry has incorporated stringent measures to provide a clean & abuse-free namespace for genuine Professionals. With zero tolerance towards abuse, you can stay assured of being associated with a reputed namespace.